Wesleyan University Press, 9780819576743, 264pp. 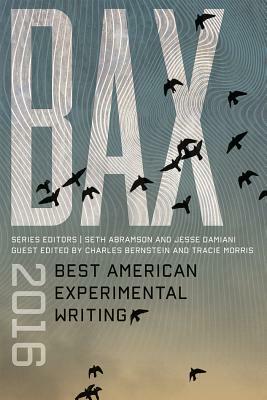 BAX 2016: Best American Experimental Writing is the third volume of this annual literary anthology compiling the best experimental writing in poetry, fiction, and creative nonfiction. This year's volume, guest-edited by Charles Bernstein and Tracie Morris, features seventy-five works by some of the most exciting American poets and writers today, including established authors--like Sina Queyras, Tan Lin, Christian B k, Myung Mi Kim, Juliana Spahr, Samuel R. Delany, and even Barack Obama--as well as emerging voices. Intended to provoke lively conversation and debate, Best American Experimental Writing is an ideal literary anthology for contemporary classroom settings. CHARLES BERNSTEIN is author of Pitch of Poetry and All the Whiskey in Heaven: Selected Poems. He is the Donald T. Regan professor of english and comparative literature at the University of Pennsylvania.TRACIE MORRIS is the author of Rhyme Scheme, Intermission, and handholding: 5 kinds. She is professor and coordinator of performance and performance studies at Pratt Institute, Brooklyn, New York. SETH ABRAMSON is the author of five poetry collections and is an assistant professor of english at the University of New Hampshire. JESSE DAMIANI is a former Wisconsin Institute for Creative Writing fellow and current contributing writer for Indiewire and The Huffington Post. He lives in Los Angeles.